This week, we got a chance to catch up with Boo Knits, fabulous designer of all things elegant and lacy. Check out all her patterns here, and read on to learn more about her! Hello! Please tell us a little bit about yourself. Hi – My name is Bev, I live in England where I design shawl patterns under the name of Boo Knits. My Aunt tried to teach me when I was only about five or six but she gave up on me quite quickly as I just couldn’t hold my needles in the way she held hers. I took it up again after reading the Blossom Street books by Debbie Macomber. It was after a jokey remark to my husband that I wasn’t going to get a job, I just wanted to sit in the corner and knit – he replied that I didn’t knit and I told him I was going to start. I did start but confess that I still don’t hold my needles properly – but it works for me. I bought a skein of Fyberspates Faery Wings in a gorgeous colour called Dragonfly Wings. I was determined to find a pattern that would give me a wide and shallow shawl out of one skein but couldn’t find one and couldn’t afford a second skein so I decided to have a go at creating a shawl of my own. It was never intended to be a pattern, it was just for me and I merely named my project after the colour of the yarn but when I put the photographs on Ravelry so many knitters asked me to write the pattern out and share it I had a go and Dragonfly Wings was released. Your shawls are stunning. What draws you to designing shawls and wraps in particular? I have a short attention span and a shawl always fits! I love that you can knit a shawl in almost any yarn – you can make cosy thick shawls or elegant light evening shawls. I love the versatility of them and the many different ways shawls can be work. You can get away with wearing the plainest clothes and transform them into something really amazing with accessories. There are a few that are very popular – Fragile Heart and Out of Darkness are always favourites. Fragile Heart is very simple and so easy to make bigger should you want to enlarge your shawl, versatile too as you can knit it in almost any yarn but will need to adjust your needle size. Out of Darkness was designed as my first Mystery Knit Along and was huge fun. It has a special place in my heart as the pattern was released on what would have been my Nan’s 100th birthday. Where do you find your inspiration when sitting down to design a pattern? Wow – inspiration is everywhere; frost patterns on windows, stained glass, gravestones, lichen, clouds, stars, morning dew, flowers, petals, seedpods, veins in leaves, knots or the grain in wood . . . Really, inspiration is everywhere we just have to open our eyes and look. Do you have any tips for knitters embarking on their first lace project? Which of your patterns would you recommend to start with? 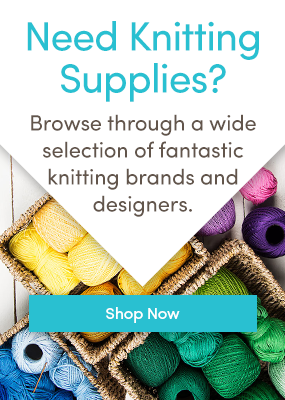 Buy the nicest yarn you can afford – something you absolutely love. If you use something ‘that will do to learn’ you won’t finish your project. If you have an investment and a love for it then you will have a determination to see the project through and once you have blocked your first lace shawl you will be addicted! Blocking is magic! Most of my shawls are quite easy, especially Fragile Heart – great as a first toe in the water for anyone wanting to start knitting lace shawls. I am planning to design a collection of shawls that are simple and effective but not boring – a collection of four shawls for beginners to lace, each getting a little more ambitious so building confidence and introducing new skills with each project. Any tips for those trying out beadwork for the first time? Buy Miyuki beads (they are the best in my opinion) and have a little practice on a swatch first – once you have put a couple of beads on it becomes second nature and they add a wonderful weight to your project. Don’t be put off thinking that your shawl will be ‘bling central’; beads don’t have to be over the top or blingy they can be understated and elegant and they help to create good drape and a weight to your shawl. Ha ha! I never think of myself as being a designer, I am a knitter first and foremost. First thing each morning I check my messages whilst drinking the compulsory cup of coffee (first of the day) and then I write my ‘to do list’. Things don’t always get done on that day but I find it helps to keep me focused. Each day is different, I don’t do routine but I realise that I am amazingly lucky to get to spend my days playing with lovely colours, beautiful yarns and two sticks – sometimes I play with pens and graph paper too but mainly I am a simply a knitter and love nothing more than to sit and knit whilst listening to a good audio book. I always use circular needles, I absolutely love yarn, and there is no shame in using stitch markers – they keep you on track and make it simple to spot any errors. Saying that though, my absolute must have accessory – I couldn’t knit without a good cushion behind me and a comfy chair. This is such a difficult question! I know that because I mainly knit shawls I tend to buy more expensive yarns so out of the yarns I use I guess it would have to be a pure silk. It takes colour really well is kind to the skin, smooth, soft and amazingly strong – good job as I block like a demon! I love Bev’s shawls. I knitted Dragonfly a Wings about three years ago and have knitted over a dozen of hers since, all stunningly beautiful and wonderful to knit. She is a lovely lass too! I am a proficient crocheted but started learning to knit recently. I would love to make one of her shawls. Where can I purchase her patterns? Love your patterns! Some day when I’m rich…. Great article – many thanks for posting this. I love Boo’s designs; I was introduced to them by Kay in St Ives last spring and made 3 shawls since then, and am becoming a Boo addict. So many more of her patterns to try, if only there were more hours in the day! Wave to Kay – hello there! Most of my patterns are here on Love Knitting Odalys and I shall import Dragonfly Wings for you too Rose; it was my very first pattern and a little different from the others. I am in the process of knitting Winter sweet and found a mistake in the print pattern on page 9 – row 9 it says 14 sts left at the end of the row but if you count pattern sts there are actually 15! Apart from that ii am enjoying the experience as it is my first go at Lacey shawl!